What Is a Redemption Fee on a 401(k)? The Securities and Exchange Commission sets guidelines on redemption fees for 401(k) investments you sell. Some mutual funds that are qualified investments for 401(k) retirement plans charge a redemption fee when you redeem, meaning to sell, your shares. Redemption fees are charges in addition to specified sales charges that may apply. These fees lower your 401(k) balance, reducing the deposit dollars that go into your account. You should be aware of these charges in advance of your order to sell your mutual fund investments so you can prepare for lower cash deposit amounts. Mutual funds may charge a fee called a redemption fee or short term trading fee if you sell your shares soon after buying them. If you think you may cash in your shares quickly, make sure you understand the fees and the length of the short term redemption period where the fees are charged. The Securities and Exchange Commission caps redemption fees at 2 percent of the value of the mutual fund or investment being liquidated. The justification for redemption fees, and SEC regulations permitting them, is to discourage 401(k) participants from adopting short-term buy and sell strategies, since retirement savings plans are designed to be long-term programs. The mutual fund also specifies the conditions under which redemption fees are imposed. Since the goal of redemption fees is to discourage 401(k) participants from constantly shifting investments, most mutual funds set clear minimum timing limits for holding investments before sale or liquidation. Typically, these minimum holding periods are reasonable, without causing major investor resistance. For instance, your 401(k) mutual fund may have a 2-percent redemption fee that it only charges if you sell a fund within 30 days of purchasing it. While redemption fees may force you to think twice about buying and selling mutual funds, unlike individual stocks, mutual funds often take time to deliver strong returns. Their diversity of investments typically perform well over time, without short-term price spikes that may not endure. 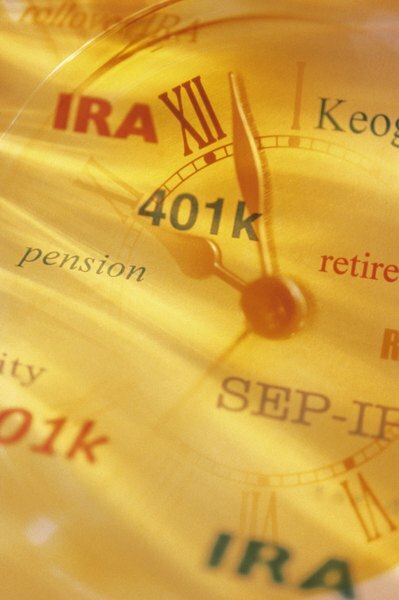 Retirement savings plans, such as 401(k)s, target long-term growth, particularly important for younger employees. If you favor frequent trades with your other investments, redemption fees could encourage you to take a more effective long-term strategy with your 401(k) investment options. Long-term strategies are always recommended with 401(k) funds, but if you need to access your retirement savings money before you would like, because of medical or financial emergencies, you might be forced to liquidate some 401(k) investments to generate cash. Redemption fees will reduce your proceeds from a forced sale. If your 401(k) investments are performing, a redemption fee of 2 percent will reduce your gains, perhaps significantly. Remember that you'll also face taxes and Internal Revenue Service penalties if you liquidate a 401(k) or another retirement account before you turn 59 1/2. In some cases, borrowing against your 401(k) may be a better long-term strategy if your plan allows it. Mutual fund options in 401(k) plans may have both front-end charges, when you buy mutual funds, and back-end fees, such as charges when you sell these investments. Redemption fees are back-end fees, also called back-end loads, since they trigger when you sell within the fund minimum holding period. It is critical that you become aware of all fees, front- or back-load varieties, before you select your 401(k) investment options. These fees are deducted from your 401(k) retirement savings balance, demanding that you invest wisely.